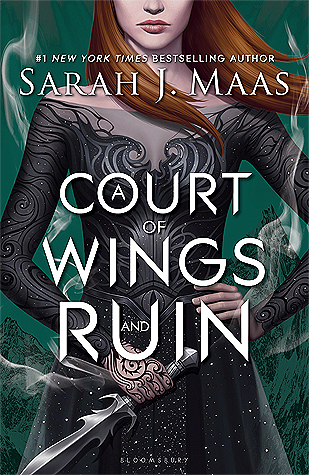 SYNOPSIS: Feyre has returned to the Spring Court, determined to gather information on Tamlin’s manoeuvrings and the invading king threatening to bring Prythian to its knees. But to do so she must play a deadly game of deceit – and one slip may spell doom not only for Feyre, but for her world as well. I originally reviewed this right after it came out in May of 2017, but honestly, that review was such a mess of spoilers and rambling nonsense that I decided to redo it after my reread. I know that rewriting entire reviews might seem odd, but the original one was fairly cringe-worthy. I digress! First, I want to get a few complaints out of the way. Rereading books that we love often gives us room to step back and view things a little more fairly, and this was no exception: my biggest problem is that this book is long. I don’t mind long books as a rule, but ACOWAR struggles from a lot of filler material and it honestly could’ve been a solid 100-150 pages shorter and packed a bigger punch. My other main struggle is with one of the points of the ending: there’s an event that happens regarding Amren in this installment that I personally found kind of cheap and disappointing, no matter how much I love her as a character. I almost felt as though the ending was written as more of a ‘fan service’ than anything. On a more positive note, though, what really gives this series its shine is its incredible cast of characters, with so many complex, lovable little Fae that I hold so near and dear to my heart. → Rhysand, the High Lord of the Night Court and one of the greatest love interests I have read in my entire life. He is so warm, and loving, and fiercely devoted and protective of his little family. His self-sacrificing nature is beyond heartbreaking, and he’s been through so much trauma, but he’s the best little cinnamon roll I’ve ever seen and I could go on for days about what he means to me. → Cassian, leader of Rhys’ armies and Illyrian warrior extraordinaire. If I could pick any fictional character to be besties with, it would probably be Cass, with his ridiculous antics and humor and desperate need to take care of his friends. → Azriel, the Illyrian spy, who never meant quite as much to me until this book, with his devotion to Feyre and their family, and the lengths to which he will go to end the war ravaging Prythian. → Morrigan, Rhysand’s cousin and confidante. She’s been my least favorite member of the Inner Court this entire time, but I’ll admit that I do see her in an entirely different light after the events of ACOWAR. → Amren, the jewelry hoarding, blood consuming, terrifying little monster and Rhysand’s second-in-command. Her development was the one that disappointed me the most in this book, sadly, as I had some theories about her character that fell flat, but she’s still fascinating as hell. → Lucien, the walking, talking conundrum whom I have loved since the beginning of the series, but who managed to worm his way into my heart even further in this installment (especially with his caretaking of Feyre in the early chapters). → Feyre, of course, who has steadily won me over as this series has progressed and she has come into her own as a powerful Fae and High Lady. I loved the bitter thirst for vengeance she displays in ACOWAR, and even if I didn’t think all of her decisions were thought out well, I never stopped rooting for her underhanded methods and ideas. Finally, honorable mentions go to Helion (my absolutely precious poly baby—and that twist! ), Tarquin (I was so happy to see him again, after the events of ACOMAF), Jurian (I didn’t see that coming, but I loved him so much? ), Tamlin (still a piece of literal garbage, but I somehow loved his redemptive moments regardless), and the terrifying trio of Bryaxis, The Bone Carver, and The Weaver, all of which I would happily sign up for novellas about because holy hell, they’re amazing. Have a lovely week, dearie! Oh my gosh, your review is such a stark contrast to Emma’s review WHATTT! I find it so interesting how people will either love or hate this series, unfortunately, I just don’t think it’s for me! I really liked this entire series but I agree that this one was a bit too long. Despite giving it 4 stars (I think that’s what I gave it anyway lol) I do have some major issues with the ending and KINDA SPOILER I GUESS! How I don’t think SJM would ever kill off one of her mains. It just seems that they always come back and that feels like such a cheap way to get emotion out of a reader while not upsetting the biggest fans because, of well they didn’t actually die. I just finished this book and I loved it, although I totally agree that it could have been a bit shorter. I’m curious what it was about Amren’s storyline that you didn’t like, but I guess it’s hard to say that without giving spoilers. 1) I was disappointed by the “cauldron” moment with her. I love her, don’t get me wrong, but it cheapened the moment for me and I think it would’ve carried more emotional weight if that “thing” had been… permanent? I hope this makes sense despite the vagueness lol. I agree about the permanence issue for her and another character. I mean, now that Frost and Starlight has come out, I knew that nothing like that could happen with any lasting consequences. True, I guess knowing ACOFAS is out would kind of ruin the suspense of that one, lol! Oh well, still really enjoyed the series! I’m not sure how she’s going to continue it for three more books though. I actually hope she moves away from Feyre and focuses on other characters. Supposedly, we’ll barely be seeing any of Feyre and Rhys in the coming books! I want to say I read that she officially confirmed at least the next book will focus on Cassian and Nesta. I don’t care much for Nesta but I adore Cass, so I’m excited! That would be amazing if that’s where she’s focusing! I wouldn’t mind more of Elain and Lucien too. Agreed! Especially Lucien, I love him and really loved the new developments in his story in ACOWAR.